In my experience as a business model innovation consultant and in the many success stories of strategic communication I’ve witnessed, strategic transformation is never easy but with the right approach it can become less painful. Manuel Hensmans gives great insight into this topic through his book, Strategic transformation. In it, he describes companies that have undergone successful business model change in all facets of its company. According to Hensmans, and it’s something I agree with completely, change happens all the time and that it’s going to happen again and again. They key to facing transformative change and emerging intact and even a bit better than before is through proper planning and preparation. Hensman stresses that planning for strategic transformation isn’t simple. But devoting the right amount of effort, expertise and foresight to it can be key to surviving and even winning while the change happens. Still, I can’t deny that most change is needed when business becomes difficult or a financial crisis is at hand. But there are things that can be done so that preparing for any sort of imposed or self-induced change happens. 1. Plan for decades, not months. One of the keys to surviving any sort of change is to plan. But what most irresponsible and less-apt COOs do is that they plan for a few months ahead based on what’s happened the previous year. The more enterprising and visionary leaders know that change can come gradually, suddenly and even subtly. Planning for the next few decades in a meticulous manner covers a lot of bases and leaves less room for things to fall through. 2. Always think that economies are unstable and rarely act in a linear manner. Linear planning presumes that things happen one after another. Hensmans and I happen to agree on the fact that things happen all at the same time in quick succession. 3. Be prepared to sacrifice. Any change results in some sort of loss. Being ready to sacrifice parts of the business (markets, products, services…) to ensure the survival of the core operations is normal during the process of strategic transformation. Good planning on your part may mean that you’ve already outlined which things the company must sacrifice to keep things afloat in troubled times. 4. Traditional leadership is not the answer. Whenever any sort of transformational change occurs, the leadership has to respond to it. Change isn’t going to flow and adapt to traditional systems, it disrupts it through and through. This means that ‘shadow leaders’ or alternative management may be the answer to the problem of changing leadership. You may have to get people who are experienced with dealing with crises and how to overcome hurdles. In essence, dictatorial rulers are the worst possible people leading a company through change. 5. Reinvention and innovation of your business models is a good place to start. When you feel at a loss and the change comes too sudden, look to the historic business model your company employs. It can serve as your inspiration and a guide on what you need to change about your company. 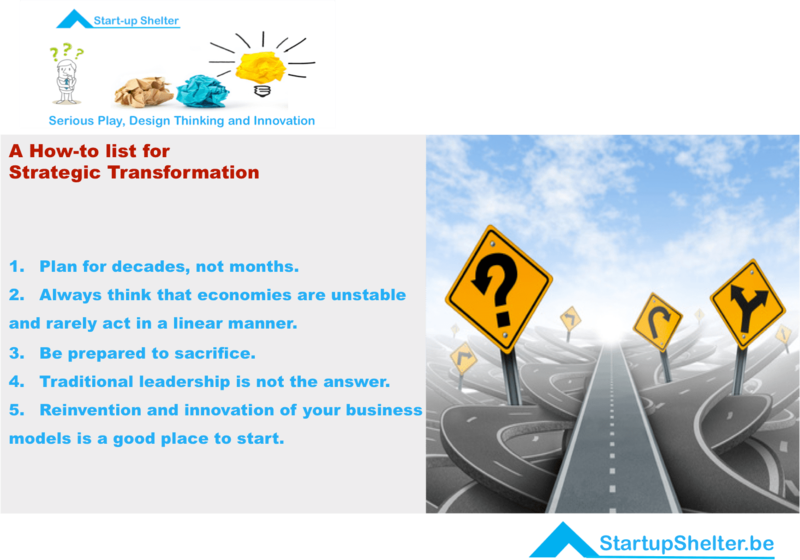 Essentially, strategic transformation involves non-linear planning that forecasts economic stability and frequent changes for decades ahead. Companies that hire leaders who can adapt and respond innovatively to change and are ready to sacrifice are the ones that will surely survive and even win after the change.